After I graduated from the youth and tween books, I found myself gravitating toward works by Stephen King. I’m talking about the old-school King like It, Tommyknockers, and The Stand. These were the books that would scare the crap out of you. After time, King’s books drifted away from scaring you out of your pants and seemed to tame a little. They’re still great works, but they seem to have lost a bit of that extra edge. So, who would pick up the mantle of fantastic horror? I’ve read several authors, waiting for the next Stephen King. I had not found such writer until now. 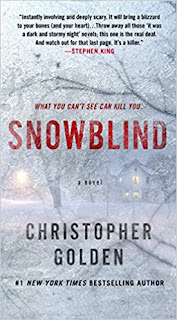 Snowblind by Christopher Golden is the book that filled the very large shoes of Stephen King. There was just enough supernatural mixed in with reality to make the reader feel comfortable until the next page scares the crap out of you. The beginning of the story begins twelve years before the action of the rest of the book. In a New England town, the winter brings a blizzard of epic proportions. Amid the swirling, blinding flakes of snow, there is something mysterious and dangerous. Dancing in the darkness of the storm are ghostly figures not of this world who lure people into the cold. These people are never to be seen again. They are gone without a trace. Fast-forward twelve years, Coventry is facing yet another monster blizzard, and the mysterious figures in the snow are returning. Jake Shapiro, a photographer who lost his kid brother in the last storm, and Joe Keenan, a police officer who lost kids in the storm at the beginning of his career, feel a sense of deja-vu. There is something amid the snowflakes that brings those memories of the earlier storm. When long lost family members start inhabiting the bodies of friends, they bring warnings of creatures in the storm. They must all work together to keep the town safe from the snowstorm. Can they overcome their own superstitions and distrust to save their homes? Golden has woven a tapestry of horror into the politics of a small town, where everyone knows everyone else and knows most of the secrets the try to hide. He starts of with mysterious disappearances that belies the fact that this is a horror novel. The reader knows something is out there, but the author folds you into a comfortable cocoon to set you at ease. Then when the second storm hits, he rips away the safety netting and delivers evil. Who will survive? Who will end up a friend? Can they push the evil away and return Coventry to its former, idyllic, New England town glory? Golden keeps us turning the pages to the very end. There are very few lulls in the action. The characters are written with flaws that they must overcome to achieve their goals. Our heroes sometimes question the next decisions. These doubts and actions only serve to make the story that much richer. 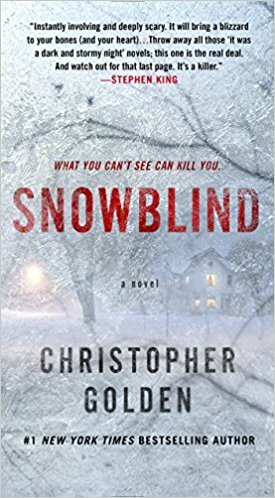 Snowblind by Christopher Golden is a terrific read. It is a very worthy successor to the early books of Stephen King. King even provides a back cover review of the book, giving it great accolades. Next time you’re at the library looking for a good book, try picking up this one. A hard to find good book is worth the search and the time. Craig Bacon likes a good story that sometimes makes it hard to sleep at night.